Roof is a product. He is neither natural nor inevitable. He embodies both white supremacy and the failure of white supremacy–that is, like capitalism, white supremacy is self-immolating. Ask yourself, how can capitalism be the “best” system if it is always collapsing? How can white supremacy be “supreme” if a person like Roof exists? He is not Donald Trump or “shirtless Matthew McConaughey;” he is poor, unastute, unpretty, “degraded” whiteness–whiteness that is supposed to stay in the racial closet so that supremacy is believable. He is an old formation of white supremacy that is supposed to no longer exist because the elite white supremacists no longer carry this model. It is my hope that white and black people alike are tired enough of our white supremacist culture to finally do something about it. Because, believe it or not, there are situations where cooperation and work across racial difference is actually MORE fruitful than racist notions of scarcity. Step one: disintegrate whiteness. Find particularity again. Know your racial histories. Learn multiple narratives. Locate your individuality within community. Step two: abandon the logics of scarcity; invest in something other than your best interest. Invest in other people. Find a cause that you believe in that is bigger than your own purity, safety, guilt, or lonesomeness. Do explicitly racial, anti-racist work. Do it everyday. Step three: give up power, share power, empower others, amplify their voices, only know what can be rightly known through encounter and the gift of exchange; be undone by another; learn limits. You might have to pull a Dave Chappelle. Just make sure you have a community to do this work in. Ladelle McWhorter, Racism and Sexual Oppression in Anglo America: A Genealogy; Emilie M. Townes, Womanist Ethics and the Cultural Production of Evil. These are not easy books because of the content and because of the stories that they tell. But they are worth it. Read them multiple times. And let’s go to work. Leonard Curry is a PhD candidate in Ethics and Society at Vanderbilt University. He is also an ordained elder in the African Methodist Episcopal Church. His current research includes Black radical traditions, anti-colonial and postcolonial thought, critical race theory, and critical social theory. 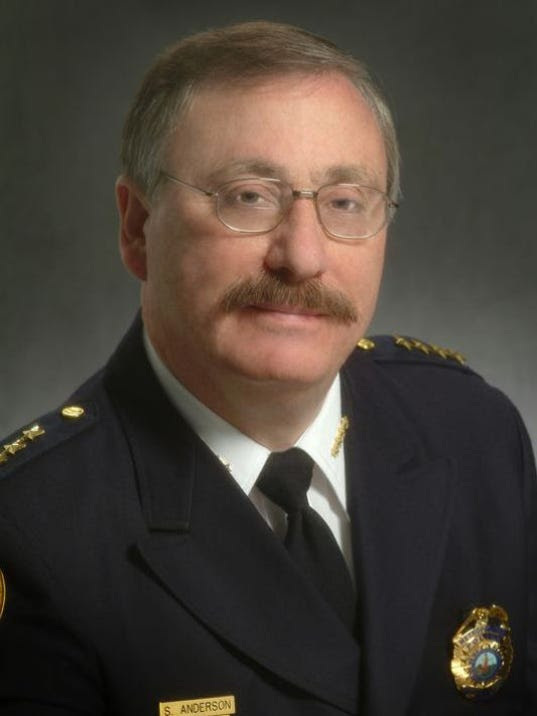 Nashville’s chief of police has garnered praise from a wide spectrum of people for his response to local protests against racist police violence. But celebrating a police chief for refraining from harming protesters and defending our right to “express” our “thoughts” only decenters the real cause for celebration: the growing coalition building power in the movement against white supremacy and economic injustice in Nashville and beyond—a coalition and a movement whose message Chief Anderson has thus far successfully refrained from acknowledging or engaging in any meaningful way. Thus, we see no reason to spend energy celebrating Chief Anderson until he concretely joins us in the struggle to dismantle white supremacy and economic injustice—which would mean significant changes in what policing looks like in our city. In response to protests nationwide against the murder of black men, women, and children at the hands of white police officers, and against the subsequent non-indictments of those officers, chiefs of police across the U.S. have dealt with demonstrators swiftly and aggressively, in many cases with billy clubs, rubber bullets, tear gas, and jail cells. In responding in such a way to protests against racist police violence, police departments have only reinforced the point the demonstrations have sought to make: policing in the U.S. is inherently violent and inherently racist. 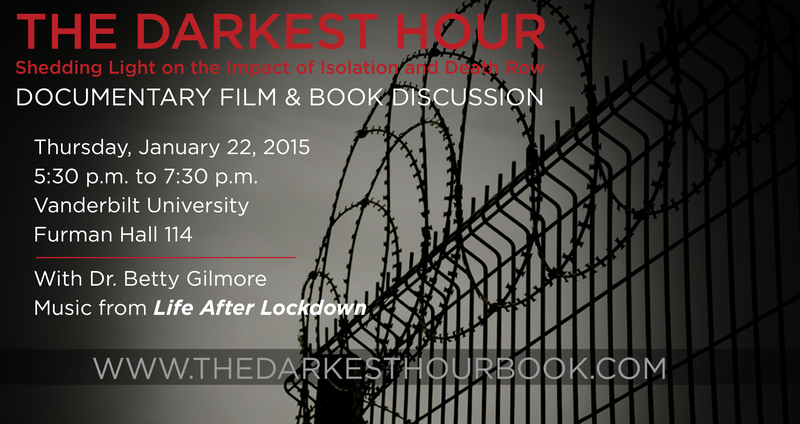 Join us for a screening of the documentary film, “The Darkest Hour,” and a discussion with Dr. Betty Gilmore, co-author (with Nanon Williams) of the companion book. We live in the age of racialized mass incarceration. An age in which tens of thousands of human beings are caged in solitary confinement every day. Some for decades at a time. The documentary film, “The Darkest Hour” exposes the inhumane impact of extreme isolation experienced by those incarcerated nationwide. – The color of a person’s skin determines whether they live and how they live. Until these shameful horrors really are… NO MORE! Wear orange all day long! The Vanderbilt Divinity School in conjunction with the Graduate Department of Religion and Vanderbilt Black Seminarians will host “Nightmare on Our Street! : A Teach-in On Racialized Violence in America” on Thursday, October 30th from 4-6:30PM in the Reading Room located in the Divinity School. This teach-in seeks, through a religious lens, to analyze, critique, and respond to the racialized violence inflicted on communities of color and the systems and structures that reinforce institutionalized racism. Panelists will include Mr. Keron Blair, Campaign Strategist and Field Director at Raise IL, Ms. Darria Janéy Hudson, Multicultural Youth Organizer at Tennessee Immigrant and Refugee Coalition, Rev. Dr. Christophe D. Ringer, Visiting Assistant Professor of Religion and Philosophy at Christian Brothers University, Dr. Stacey Floyd-Thomas, Associate Professor of Ethics and Society, Rev. Mark Forrester, University Chaplain and Director of Religious Life at Vanderbilt University, and August Washington, Associate Vice Chancellor and Chief of Vanderbilt Police Department. Dr. Herbert Marbury, Associate Professor of Hebrew Bible, will serve as moderator. Photos from the Teach-In on Mass Incarceration and the Death Penalty at the Nashville Public Library, September 13, 2014. Photography by Luke Myers. Stay tuned for the follow-up to our Open Letter to Stop Executions! 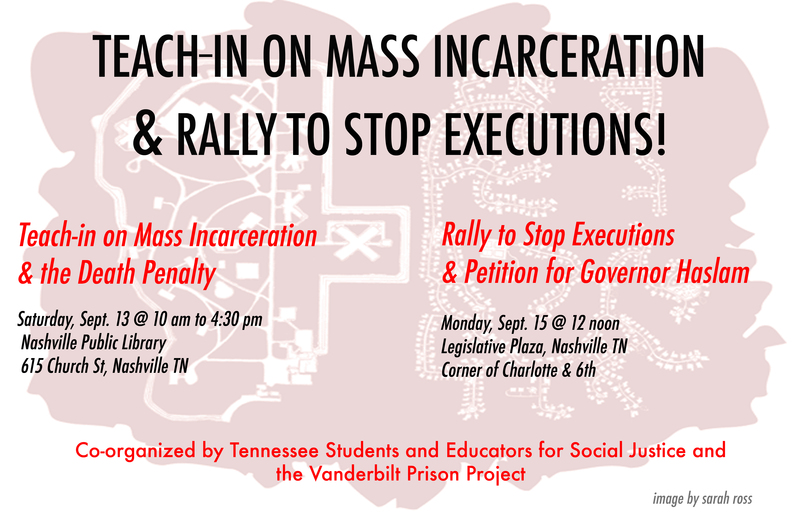 Rally to Stop Executions – TODAY in Nashville! As students and educators, we seek to understand the world and to share our understanding with others through a practice of critical thinking and responsible action. Therefore, we cannot remain silent as Tennessee plans to execute people in the name of justice. We call upon Governor Bill Haslam to suspend all scheduled executions immediately, and to commission a full and transparent review of capital punishment in Tennessee. Today at noon, Tennessee Students and Educators for Social Justice will send a delegation to deliver our Open Letter to Governor Haslam, asking him to stop currently-scheduled executions and to conduct a full and transparent review of Tennessee’s death penalty system. Come out and support our delegation! Bring signs to express your views and banners to represent your school, college, community group, or congregation.